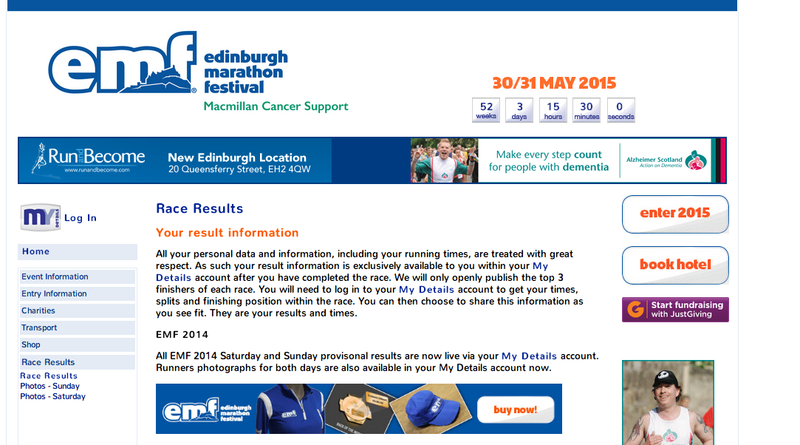 Is there a more sinister reason for Edinburgh marathon results to remain unpublished, other than “data protection”? 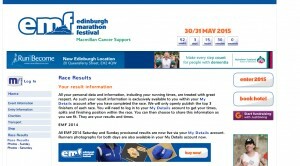 This past weekend has just seen the 12th edition of the Edinburgh Marathon Festival (although there has been an annual marathon in the city since 1982), and for the past three years, organisers GSI Events, have taken the unusual decision not to publish the results beyond the first three male and female runners in each race. This decision has been met with a mix of scorn, criticism and anger across social media outlets and running forums across the country, from runners who view the results list as an intrinsic part of the race package. Many runners, particularly those seeking to race for a particular time, rather than just to complete, are interested in the results list. They like to compare themselves to friends and clubmates, to other people in their age category, to people that they might have raced against before. Other fans of the sport may not have run the race, but still like to look out for the names of friends and colleagues or other athletes in whose performances they have an interest. Plenty of people have demanded an explanation from the organisers, but GSI have steadfastly refused to enter into any debate on the subject, whether it’s on their facebook or twitter accounts, or on popular running forums where the matter is being discussed. All your personal data and information, including your running times, are treated with great respect. As such your result information is exclusively available to you within your My Details account after you have completed the race. We will only openly publish the top 3 finishers of each race. You will need to log in to your My Details account to get your times, splits and finishing position within the race. You can then choose to share this information as you see fit. They are your results and times. Keeping people’s results private doesn’t seem a particularly convincing explanation, seeing as how you can go onto the website that sells race photos (marathon-photos.com), enter a name and up pops their photos with their finishing time alongside. Now, at Xempo, we must admit a vested interest here. Due to the nature of the product we sell, we chose to use published race results to verify the race times submitted to us by our customers. Whilst we can still use the marathon-photos website, it isn’t really a problem to us. But in our three years of existence, GSI Events are the only ones we have ever come across (in the whole world) where results list are deliberately hidden from view. So for us it’s only a mild inconvenience, but for runners the results and ranking do matter. Many will need to use them as qualifying criteria to other races. The Boston Marathon and London Marathon request a link to the official published results, which is quite difficult when they don’t exist. And similarly, many will want an official listing of their time on ranking websites such as Power of 10, or Run Britain, to show where they sit in comparison to their peers and clubmates and fellow age groupers. If no results list exists, then we might as well just all run round our own local parks on our own and record our own individual times, seeing as how they would, just as in Edinburgh, similarly have no context. 3.9.1 Races must provide fully electronic timing by use of active or passive transponders. Real time splits and final results should be made available to media, spectators and online. 3.12.1 Races shall email the official results of the competition for the top 20 male and top 20 female finishers to the IAAF immediately following the completion of the competition, using the format in the Race Directors Report Form. 3.12.2 Official Results for all participants should be made available on the race’s website within the shortest possible time. If therefore they are obliged to publish results, and have actively chosen not to (there is no legal basis on which data protection is a valid excuse, particularly as thousands of races have no problem doing so every year), then what is the real reason? Well, we are left to conclude that they have something to hide. And to understand why, you have to look at the race not as a runner, but as a potential investor or sponsor. They simply don’t want us to know how many (or how few) are actually running in their race. As a business in the running industry, Xempo (and any other business in this sector) look to put ourselves where our customers are. That means supporting races through sponsorship, going to race expos to sell our wares, or advertising through event literature. The companies who take our money to be there, be they exhibition organisers or race event managers, like to sell their events to us based on the number of participants who we are likely to encounter. The overwhelming majority are open and honest with their customers, but too many frequently overstate this number by quoting clearly inflated numbers, such as “number of race entries” rather than “number of finishers” – the latter is usually between 20-40% lower than the former. The London marathon for example is a major investment for any exhibitor (a big brand will spend about £150k just to be there) and even for small companies like ourselves, it will be our biggest expenditure of the year running into several thousand pounds just for the floor space. The organisers sell it to us on there being upwards of 70k visitors. We know that this is a number based on 45k race entries plus an additional estimate of friends, family and other non-related visitors. We similarly know that 10k runners won’t register each year, and the additional estimate is way off the mark; just try coming along on a Thursday afternoon and it can feel almost empty in there! London marathon isn’t the only running exhibition that overstates its popularity. Some others do the same, and races can similarly be, shall we say, over-enthusiastic about how popular they are. It is understandable as to why they should do this, but while a race might tell us how they have three thousand registered entrants, they are pretty reluctant to mention subsequently that only two thousand ran on the day, as we had already noticed in the results. Edinburgh has for years happily called itself “Britain’s number two marathon”. Whether this was based on quality or quantity has never been apparent. However, with dwindling numbers (only 8620 finishers in the full marathon this year – we asked someone we knew was running and who had access to their own finishing position in relation to the field), it is clear that it is not in their interests to disclose too fully the annual results lists in case this decline in popularity becomes too much of a concern to sponsors and, perhaps more importantly, potential future sponsors. Far easier to just add up all the entrants to all the races and quote an more uncontestable bigger number. With Brighton, Manchester, Chester, Liverpool and York all offering similar sized marathons, Edinburgh might have to reverse their declining entry numbers if they still want to keep this arguable unofficial title. As a business in the marathon world, we are only too happy to get involved in offering support, sponsorship and investment in any race; we just ask that we get fair treatment in return, and not an obfuscation of the statistics in order to convince us to invest unwisely. Of course, this is just our theory of why Edinburgh is behaving uniquely in this regard. We are happy to be proved wrong if the GSI team would care to respond. But perhaps they should respond to the many runners who have already asked them the question direct, as to why results haven’t been published. We can wait. Thanks for posting. I really do hope that the additional pressure reverts their decision not to publish. This was my A race for 2014, with my sights set on a top v50 ranking. I trained hard and managed a 2:38:42, and 14th place. This would have put me 4th in UK v50, but to no avail. Some may say this is trivial,but to me it is important, and one of the reasons I continue to race. I love this sport, and have done for most of my life, but today I feel sorely let down. Thanks for the post Dan and I think it is spot on. Similarly to Simon, I feel sorely let down by the none public release of results. I finished 8th with a new pb of 2:28:32 but all I have to go on is the result they have provided to me. No one else can verify what I am saying is the truth. I suspect this could be the undoing of the Edinburgh marathon in its current form. I have no issue with it being run by a company looking to make a profit but is it not true that as a business you should always start with the customer and work backwards? Every self respecting athlete expects results to be made public. I shall not consider going anywhere near their events again until they reverse this decision and I imagine any committed club runner will take the same stance. Interesting read! I see we dont even have official times through as yet, still at the provisional point. BUT I agree I want to see this race on my RunBritain alongside the 2012 time!!! I should be ranked 20th Vet50. The reality is that GSI is a company and they want to make money. The comments above are from runners and I recognise many of the names and know that these people finish in the top few percent of every race. The fact is that therefore by definition 98% or more of the race are behind you and that is the majority and as a company you have to pander to the majority. Running a marathon is a bucket list event: people want to do one and be congratulated by their friends and quite frankly not be told they were 7900th out of a field of 8000 and finished at a pace which is quite frankly a brisk walk. Look at he publicity Jason Scotland-Williams got for cutting a corner at VMLM. We are seeing more and more of this where companies organise “events” and they are not the old style AC races we know. Look at all the muddy off roaders, do not even give a finish time etc etc. Philip – you are right in that GSI are an events company whose prime motivation is profit. Nothing wrong with that, provided they provide a fair product for their paying customers. It is not unreasonable for an entrant into a running race to expect a published results list, as is available for virtually every other running race in the country. They could argue that they pre-announced that results wouldn’t be published, but it is not reasonable to tuck that away in the small print and then tell people that that was what they signed up to. You are also right in that the further up the field a runner finishes, the more likely they are to want to see their results and ranking published. But it is not their place to make that assumption and must treat each runner the same whether they were 8th or 8,000th. As we pointed out in our article, it seems that the main reason behind the decision was a commercial one, designed to protect their financial interests in the long term. Much of what they sell themselves on, to runners, corporate sponsors and local authorities, are claims made on participant numbers (30,000 runners) and race statistics (fast marathon in the UK / Britain’s no. 2 marathon). Hiding the stats means that their published claims are at best inaccurate, and at worst a deliberate misinterpretation. Data privacy is an unacceptable reason for obscuring the truth behind their decision. Looking at smaller picture , first three men, first three women, 6 runners positions and times listed . Where is the data protection there.